Do You Feel STUCK for Ideas Or Inspiration? Does Your Writing Ever Just STOP FLOWING? Discover How to Get Into "The Zone"
This site will CURE your Writer's Block FOR GOOD. READ ON to discover what you're missing... ! If you're a writer, I'm willing to bet my bottom dollar that at some point you've stumbled upon the dreaded Writer's Block. It's the point at which your ideas DRY UP. You can't imagine how your story should continue. You aren't able to turn on your creative spark. You're lost for inspiration. You feel like you're in limbo. As a writer, I personally find this the worst feeling in the world. I feel trapped. I know I have a huge hurdle to jump over, but have absolutely no idea how to do it. Usually, I go for a swim, or head to the gym, or take a stroll in the park. Sometimes I sleep on it. I try to FORCE inspiration. And it just doesn't work. Why don't I just take my mind off the problem? I can't. You see, I make a living out of writing. I need creativity ON DEMAND. I'm willing to bet you're like that too. Wouldn't it be nice if you could just press a button and suddenly find yourself overflowing with fresh ideas? Imagine if the answers to all your novel, screenplay and non-fiction writing blocks just came FLOODING IN ... when YOU wanted them... without ANY extra effort. I'm talking about REAL inspiration on tap. That's what every truly creative writer wants, isn't it? Well, I'm writing to let you know about an exciting SCIENTIFIC discovery which means you CAN experience this! Total creativity on demand. And it's all down to a little-known secret they call "binaural beats." Click HERE to buy the Writer's Block Audio Program Today! A really great job on this program, guys. I didn't believe it at first, but you really do provide inspiration on demand with this thing. The tones on the audio session really relax me now, and I'm so glad I made the purchase. Some time ago, I began a freelance writing project, producing a number of scientific articles for the website Self Development Network.com. The project dealt with studying the various "frequencies" at which the brain operates during its different modes. 20 Hz. That frequency means your conscious mind is awake and operating in simple day-to-day mode. You can verify this frequency through an EEG (electroencephalograph) reading. However, as I learned from the lead scientist in the project, the frequency of the brain changes depending on its "mode." For example, individuals in "The Zone", that positive-thinking "superlearning" state, have a brain frequency of between 8 and 12 Hz (the "alpha" frequency). Other specific frequencies were prominent during certain tasks -- while meditating, or being creative, for example. Now, if you know all of this already, feel free to skip straight to the next section. However at the time, this was TOTALLY NEW to me. I was in AWE. Imagine being able to measure what sort of "mode" the brain was in. And... I wondered... would it be possible to induce certain modes on demand? Perhaps, like, creativity? Could we become creative by simply "playing" these frequencies to the mind? I posed this question to the lead scientist. He explained that the human ears can only hear between 20 and 20,000 Hz. All the exciting stuff happens at lower frequencies, which our ears simply can't pick up. I felt disappointed - understandably. For a moment, I thought I was on to something. Then he added something that made me QUIVER with EXCITEMENT! Back in 1839, a German scientist named H.W. Dove discovered that by playing two coherent sounds of similar frequencies into each ear, a third "binaural beat" could be produced inside the mind. 410 Hz was played into the left ear. Inside the head, the difference between the two tones is realized... and a third "binaural beat" of 10 Hz is produced. This is equal to the alpha frequency I mentioned, and brings about a state of "superlearning", positive thinking and light relaxation. Today -- I discovered -- the world of binaural beats is well explored and scientifically documented. Thousands of research studies have been conducted on the matter, and you can find hundreds of CDs and software products aimed at the binaural beat market available on the Internet. The lead scientist recommended I explore currently available products. And I did. Some of the programs were poorly produced... but a small selection were amazing. I mean, truly MIND BLOWING. Simply by listening to a program using stereo headphones, I was able to experience ultra-deep relaxation... get rid of headaches... focus on my studies... even get happy and improve my mood. But there was one thing I REALLY needed: INSPIRATION, creativity, the Muse! I actually met Rory face-to-face in a café in Melbourne, and was taken "backstage" to explore his studio. To me, as both a creative writer and gadget fan, I was hooked. Within minutes of being in his studio, I explained my idea. To CREATE a program recording that would allow creativity on demand... that would enable writers like myself to blast out book ideas... to generate plots in seconds... to come up with solutions and scripts in the quickest time possible. I never wanted to feel "in limbo" again. In short: I wanted a PERMANENT CURE for Writer's Block. ... AND I GOT IT. I worked for the next two months with Rory, developing a program according to all the latest research. Yes, I know an audio program designed to "cure" writer's block sounds unusual. But binaural beats are a well-documented area of science. It's just no-one ever THOUGHT to apply them to writer's block before! Now, I don't want to get too technical on the main page here, but if you'd like to know the frequency specifications used in the Writer's Block Program we created, please click HERE. You could take these frequencies to an audio technician like Rory, specializing in binaural beats, and ask them to recreate the recording. You'll end up with almost exactly what I produced. However I don't even want to tell you how much it cost me in total. Let's just say... A LOT. But it was MORE than worth it. I personally listen to the recording almost EVERY DAY. And it's had a profound impact on my life. My creativity has ROCKETED. I never struggle for new ideas. And my workload has literally trebled! Best of all, I don't even have to sit down or meditate. I just listen as I work... NO EFFORT REQUIRED! When listening to the Writer's Block Program, my writing simply flows. I feel calm, focused and totally in the "writing zone." If ever I'm not listening to the CD and encounter a problem -- perhaps I've written my plot into a corner, or need to find a new way to present a technical problem I'm writing about -- I simply slip on my headphones and relax for half-an-hour. When I get up, I ALWAYS have the solution. No question about it. NO more being in limbo... NO more being stuck... NO more going crazy because I can't find the answer. I really can't explain just how this recording helps steer your mind toward new ideas, opening the creative floodgates. If you're a writer who wants to produce BRILLIANT ideas... consistently... then, please, I invite you to join me in discovering binaural beats... and specifically, the Writer's Block Program. One of the first people I showed my Writer's Block program to was Nick Daws, a friend and author of over 50 best-selling books (including "How to Write Any Book in 28 Days... Or Less!"). He loved it. Within weeks it was being retailed through his own Web site, and the feedback has been just THRILLING. I don't usually send testimonials and can't be bothered with hype. As such, I will say only this: GREAT JOB. It works. Well done! Would you like to become a truly fantastic writer... and tap into CREATIVITY ON DEMAND? UPDATE: The Writer's Block Audio Program is now available for just $39.95, if you buy BEFORE midnight, Friday. If you're not absolutely OVERWHELMED with ideas and solutions after using the Writer's Block audio program, then you don't pay a single cent! the program, you'll receive a FULL REFUND - minus our original S&H. You CANNOT get this audio program anywhere else, and this special offer price will NOT be offered indefinitely. So if you're THINKING about whether to purchase, or suspect this recording just might be your hidden gem, I urge you to TRY IT OUT under the 100% satisfaction guarantee. This chance discovery really did change my life. It can make a HUGE difference to yours, too. So, go on. Give it a go. Experience the ULTIMATE in CREATIVITY. You have EVERYTHING to gain. You can pay securely over the Internet using Visa and Mastercard, or any other major credit card. I know you'll find it INVALUABLE. PS. If you're a writer, I'm absolutely positive this will help you. That's why I've managed to get my publishers to backup the audio program with a 100% satisfaction guarantee. Remember, it'll cost you absolutely nothing to try it out. Click HERE to grab your copy! PPS. The Writer's Block Audio Session is NOT available anywhere else! You won't find it in stores, on eBay or at any other Web site. 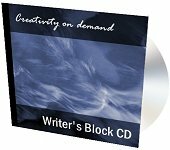 The Writer's Block Program is only available online at www.writers-block-cd.com There's NEVER been a better time to purchase! PPPS. When you leave this site, you've left. There are no massive popups begging you to subscribe to my newsletter so I can spam you to death. I don't work like that. This is your only chance to get the audio session. So if you have even a vague feeling inside that this may be right for you, get your copy and find out. It's risk-free!